Five Mile Town are making the trek back over from New Zealand's western most point, Australia. In what reads as a relatively short career thus far the (now) Melbourne based four piece have accomplished a lot. Releasing their first single in 2012 the track hit 50,000 views in only a few weeks. They followed that up with their first EP and toured extensively across both the North and the South islands of New Zealand. It didn't take long for promoters to notice the capacity this young band had for pulling crowds and in no time they went from supporting their friends to playing main stage to thousands of people at the premier Rhythm and Vines festival over New Years Eve. Enter now. 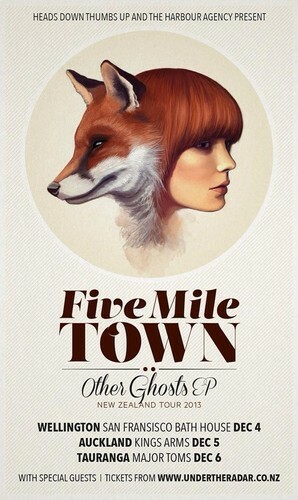 With a new home, new management and a brand new EP titled Other Ghosts it leaves the boys poised and ready to continue their climb up the ranks of the music industry. Booked to play La De Da Festival in Wellington, national tours of both Australia and New Zealand as well as good radio support; they aren't just a band to watch – they are a band to follow.